'There Are Places I Remember': Dig It! Ever since I read about this location in Mark Lewisohn’s Tune In, it’s been on my list of places to visit. It’s certainly not somewhere the Magical Mystery Coach takes you! Indeed, when I finally made it there accompanied by my 15 year old son he remarked how sinister the building looked, like 'something from Chernobyl'. He is perhaps a tad overdramatic but I saw his point. 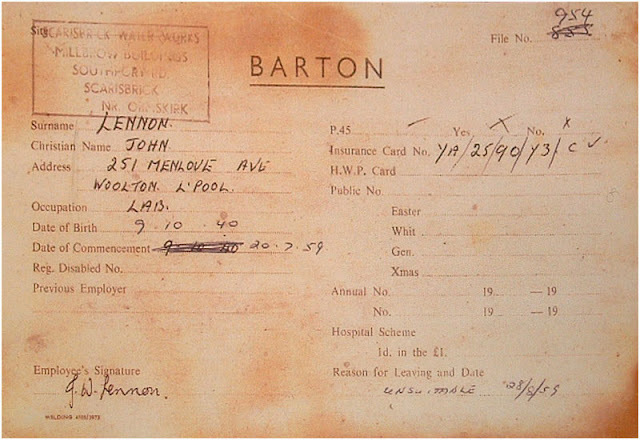 Lewisohn's book reveals that when John Lennon was 18, his art school friend Tony Carricker secured them a summer job working as general labourers on a building site in Scarisbrick, near Ormskirk. A new waterworks was being constructed by R.J. Barton and Sons, and the job came via Tony's dad Frank, who was the site foreman. Unsurprisingly, John’s inspiration to take the job was musical. His heart was set on buying an electric guitar and after hounding his Aunt Mimi for one she'd thrown down the gauntlet - if he wanted one that much, he'd have to go out and earn the money to pay for it himself. We earned a lot: for a student to have a man's wage was amazing. My dad ensured we were paid well, putting things our way, like an extra penny for working in concrete. Because John wasn't a good labourer, the foreman used to send him down to the shop to buy this or that, and while the woman was off round the back getting it, John shoplifted. He was never one to miss an opportunity. Tony and his dad didn't take John because they lived in Widnes and it was a different route - and also, as Tony admits, because me dad couldn't stand him. As a result he had to make his own way to Scarisbrick by train. The working day began at eight which meant John had to get up around five, which for a teenager who loved sleep and hated going to bed early was a constant problem but he was determined to show Aunt Mimi that he could do it. His 20 mile journey entailed train changes and a hike across town before he reached Ormskirk where the Carrickers would collect him. If John was late and missed them he had to make further train changes to end up at Bescar Lane station. As the map below shows, the station is in the middle of nowhere and from there John would have to trudge along country lanes to the building site in Southport Road (bottom left). 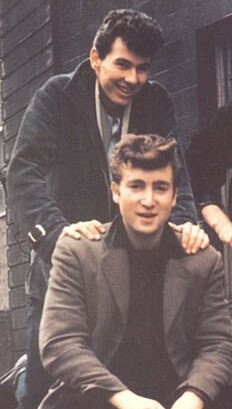 John and Tony began working on July 20, 1959. As the two art students weren’t skilled labourers they were given the lighter end of the work, using pickaxes and shovels to help ready the ground for the construction of the new water pumping station. The summer of 1959 was a hot one. John quickly discovered he was not cut out for back breaking labour and spent the entire six weeks sweating and swearing with every strike of his pickaxe. Tony learned to cope: Once the hands stopped bleeding, after a couple of weeks, I could enjoy it but John absolutely hated every minute of it – he had no physical reserves at all. He told me he used to pray every morning the train would crash. The real work, the heavy labour, was performed by a group of Irish navvies who would arrive at the site still hung over from the night before, and then dig until the sweat was pouring off them. Then they'd all go off to the canteen for a steaming hot cup of tea. This routine went on week after week until one day there was suddenly no tea as Tony Carricker explains: There was a massive big boiler which heated the hot water for the brews and John put the fire under it and didn’t put any water in. He burned the arse out of the kettle. All the navvies came trooping in, sweating like pigs, all looking for a pint of tea, and there were riots. John was sacked – which was a blessed release for him. He'd lasted six weeks. John’s employment came to an end on Friday 28 August 1959. The reason for his departure is given on his work card as “Unsuitable”. In an interview for the Weekly News in January 1964 John’s Aunt Mimi remembered that the moment he had earned £40 – enough for his guitar – he left the job. Mimi may have been re-writing the facts here to save face but one wonders whether John actually told her he'd been sacked? Not that it mattered, he'd acheived his goal and proven her wrong. She could hardly object when, on that same day. John took her to Hessys and put down a £17 deposit for a new Hofner Club 40 electric guitar. Two days later his band the Quarry Men played on the opening night of a new club in West Derby village called the Casbah. A local newspaper reporter and his photographer were there and captured John and his new guitar in action. 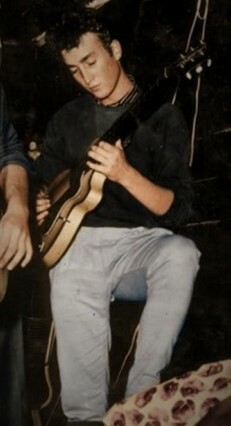 John on the opening night at the Casbah, 30 August 1959, with the Hofner Club 40 he bought with the spoils of his six weeks hard labour in Scarisbrick. Tony Carricker, passed away in October 2015. He was 74, and a valuable contributor to Mark Lewisohn's Tune In, from which his interview segments are taken. 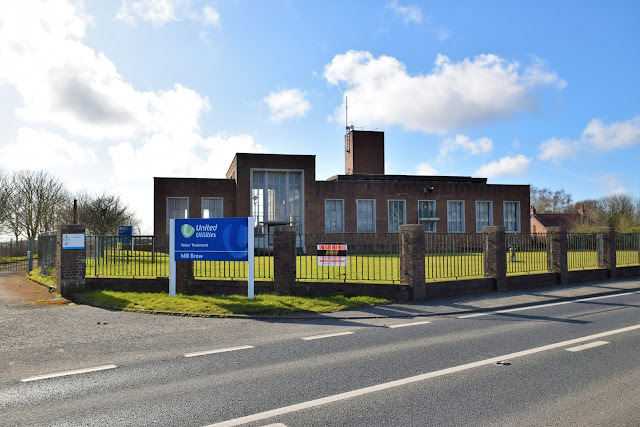 Scarisbrick Water Works is today known as the Mill Brow Water Treatment Centre, operated by United Utilities.